My study abroad experience in Morocco has made me more confident than ever that I want to pursue a profession in journalism. Meeting professional journalists, being put in positions as real journalists and not students, and being able to go after stories that we had some freedom with gave me the chance to see what my life might be like as a journalist. I want to be the best journalist I can be, and there are some things I have learned I need to improve on. I really need to buckle down with my language skills, especially Arabic. Struggling to communicate with people to have more productive interviews has motivated me to do much more to master Arabic and other languages as well. At this point, I am still unsure if I will go to graduate school. I am getting mixed advice from my teachers and mentors. On the one hand, if I were to get into a graduate program at a school like Columbia Journalism School, or Berkeley, then that would be clearly beneficial. However, the advice I have been given recently has been more along the lines of simply going into the workforce. This, my advisors say, gives me the most opportunity to learn true field reporting skills that are not always learned in grad school. An air show in Marrakesh. What has changed is what I plan to pursue after I graduate. I am very interested now in applying for scholarships like Fulbright to study post-colonial effects on Southern Italy, or a comparative study between Mediterranean countries. The more time I spend here in Morocco, the more I realize how important it is to promote the history of my heritage’s specific area, or of the greater Mediterranean area as a whole. The view of the Hassan area in Rabat. There was a point where I was on a train from Rabat to Marrakesh where we passed some very rural and poor areas, and I could not help but think of Mezzogiorno, the Southern region of Italy. (I apologize that I keep harping on this, but the awareness that I have gained from studying abroad in Morocco has had a fairly profound impact on how I see myself, the area around me, and my family’s Italian roots.) Looking at the landscape and the ocean in the distance, it just looked so familiar. Morocco and the Mezzogiorno have been victims to similar kinds of destruction. As I am Neapolitan, I feel like it is not only my place, but my duty to ensure my country is given the proper respect and opportunity it deserves. My ancestors fought and gave their lives to defend our sovereignty and dignity, and were defeated. I feel like it is my responsibility to carry on their fight in a way that I can: through journalism. I would do that by exposing the effects colonization still has on the people of the Mezzogiorno through research and field work. If I can, in addition to that, bring the same awareness I now have of the region to other people in the region, I would feel I have completed something very important. The sunset over my neighborhood in Marrakesh. My professional goals have not changed, but have felt more solid and confident. I think my academic goals have changed to reflect my greater awareness of a history and culture that I am a part of, something I am not sure would have happened to the extent that it has, had I not studied abroad in Morocco. And for that, I have one more thing to be grateful for. Me standing on the roof of our apartment in Marrakesh. It wasn’t until I woke up the morning of my flight that I really understood that I was leaving the United States and traveling to Morocco. My mind was flooded with questions and concerns that wouldn’t be answered until the following weeks. What will my host family be like? Will they be bothered by my lack of Arabic? How do they view Americans? How do they view Italians? How will I be perceived? What if I can’t find a good story for my journalism classes? These thoughts and concerns were put on hold when I saw another student from my program waiting for the flight to Paris. When we started talking, I learned that we had similar academic backgrounds, and similar preoccupations, which eased my worries. When the plane landed in Morocco, I realized I had made the right decision by choosing this country as my study abroad location. The sun was bright, the air was warm, and my expectations were high. My fellow students were discussing what their favorite news outlets are and debating various current events. This excited me to be studying abroad with students who have a similar passion for journalism. This is where I will learn to become a real journalist. Walking around, reporting the concerns of the people. What kind of training did the military men in the airport receive? How much money does our bus driver make? What is my host family’s view of the King? The first time I felt a little overwhelmed was when our host organization, SIT, was showing us around the neighborhood that we would be living in. The quantity of people on the tiny streets of the already difficult to navigate Medina made me wonder how long it would take to know my way around. However, the more time I spent on the streets, the more I made connections between the tiny streets of the Medina, and the tiny streets of Naples, Italy, the city where my father is from. The smells, the merchants yelling their advertisements, the beggars by the places of worship. Although it is different, there are very comforting similarities that softened the effect of culture shock. During my study abroad experience in Morocco, I would like to be able to learn as much as I can from the people we are working with, be they the journalists who have worked through the Arab Spring, or the students who participated in it. On a smaller scale, I would like to be able to eventually cross a busy street with as little hesitation as the local Moroccans. Baby steps. Author’s note: I am a journalism student, so I wrote this in partial fulfillment of an assignment for my study abroad program on April 23rd, the anniversary of a bombing that killed 16. The NATO bombings are a sensitive topic in Serbia, but as an American I didn’t hear about them until I met some Serbian students in college. It was really revealing to speak with the people in this article, and challenging to reconcile my own “outsider'” perceptions to the tension between everything around me-physically and ideologically! But that’s what study abroad is all about, isn’t it? BELGRADE – It is very quiet in this part of Tašmajdan Park, a stark contrast to what would have been a deafening sound 16 years ago when the building across the parking lot — Belgrade’s RTS (Radio Television Serbia) — was hit with a NATO missile, killing 16. But now the building stands half-obliterated, silent and exposed. Such a poignant reminder that, even when tucked behind St. Mark’s Church on one of Belgrade’s busiest boulevards, is still a raw and emotional sight. On April 23, 1999, six hours before the strike, journalist Sanja Radan, who worked for RTS at the time, left work to stay in her friend’s home, concerned her apartment was too close to potential bombing targets in the city center. “Suddenly my friend and I heard specific sound of projectile flying over the building,” said Radan. 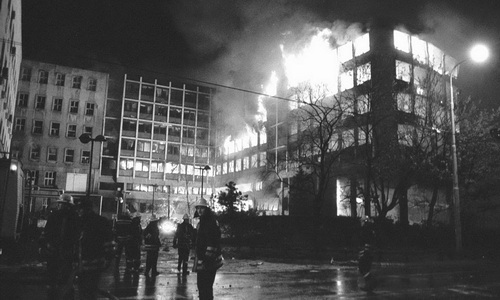 The RTS building in Belgrade, Serbia, burns after it was hit with a NATO missile on April 23, 1999, killing 16 inside. Photo via SerbiaSos. The bombing was part of the NATO mission to force withdrawal of Serbian forces from Kosovo, it’s southern autonomous province at the time. During the split of Yugoslavia in the early 1990s, ethnic Albanian Kosovars began pushing for independence from Serbia. NATO, who intervened to end human rights violations against the Kosovars and later supported the Kosovo declaration of independence in 2008, justified bombing RTS due to its role as the Milosevic (Serbian president) administration’s main propaganda arm. Unlike previous targets, the RTS was not completely evacuated before the strike. Some, like journalist Tamara Skrozzo, believe that the government used the 16 deaths—all technicians, not journalists—for their own purposes: “There is a theory that those people were put there as targets; that the government was informed but refused to evacuate in order to use the victims for their propaganda…I believe it 99.9 percent,” she said. Others maintain that NATO should never have bombed a civilian building. Even Skrozzo, who was a young “opposition” journalist for an independent anti-Milosevic radio station in 1999, agrees. While RTS manager Dragan Milanovic was sentenced in 2002 to ten years in Serbian prison for failing to protect his employees—the only conviction in relation to the bombing so far, Serbian, NATO or otherwise—many questions remain unanswered. But no answers, no reason and no blame will bring the 16 employees that perished in RTS’ rubble back to their families. These are the sixteen families that erected a small monument in this sleepy corner of Tašmajdan. An upright stone sits opposite the bombed remains of RTS heralding “Zašto?” —which means “why?”—in Serbian Cyrillic to passersby. It seems that all of Serbia, like Radan, identifies with these families’ pain. “I can’t sleep at night like so many Serbian people…[The families] are still asking themselves “why” just like me,” she said. 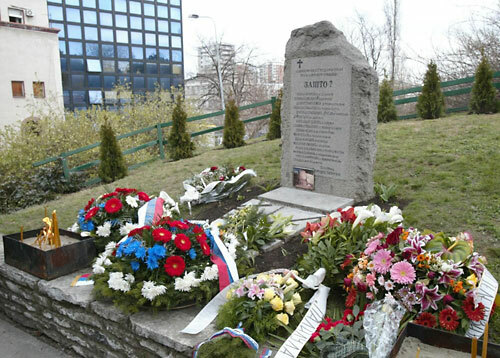 Flowers for the bombing’s 16 victims are laid in front of a monument the 16 mourning families erected in Tasmajdan Park. The current RTS building can be seen in the background. Photo via B92. “It’s really a tragedy, but you know in wars and situations like that, it happens. Always innocent people,” said 21 year old student Nevena Nikolić. Only six years old during the campaign, Nikolić’s three year old friend was killed in her home by wayward shrapnel from a different hit in Belgrade.